Øll hagtøl eru røtt pr. 17. november 2015. Kvalifiseringskappingin til EM í fótbólti 2016 er ein fótbóltskapping, ið fer fram frá september 2014 til november 2015 fyri at finna fram til tey 23 liðini, ið saman við Fraklandi, ið er kvalifiserað beinleiðis sum vertur, skulu luttaka til EM í fótbólti 2016. Tilsamans 53 landslið, ið eru UEFA limir, luttóku í kvalifikatiónskappingini. Gibraltar luttók fyri fystu ferð. 1 Feit skrift merkir: meistari tað árið. Skráskrift merkir: vertur tað árið. 2 Frá 1960 til 1992, kappaðist núverandi Kekkia sum Kekkoslovakia. 3 Frá 1960 til 1988 kappaðist núverandi Týskland sum Vesturtýskland. 4 Frá 1960 til 1988, kappaðist núverandi Russland sum Sovjetsamvaldið, og í 1992 sum SNG. Býtið av pottunum varð kunngjørt hin 24. januar 2014. Bólkarnir A–H innihalda hvør eitt lið úr hvørjum av pottunum 1–6, meðan Bólkur I inniheldur eitt lið frá hvørjum av bólkunum 1–5. Orsakað av sjónvarpsrættindum vóru Ongland, Týskland, Italia, Spania og Niðurlond trekt í bólkar við 6 liðum. For political reasons, Azerbaijan and Armenia (due to the disputed status of Nagorno-Karabakh), as well as Spain and Gibraltar (due to the disputed status of Gibraltar) could not be drawn in the same group. Unlike the previous UEFA qualifying tournament, Russia and Georgia had agreed to play each other if they were drawn together. Frakland (Coeff: 30,992; Rank: 11) are partnered with the five-team Group I, which enables the 2016 tournament hosts to play friendlies against these countries on their 'spare' dates. These friendlies do not count in the qualifying group standings. ↑ Croatia were deducted one point after charges for racist behaviour in the match against Italy at Stadion Poljud. In addition, the Croatian Football Federation were ordered to play their next two home matches of UEFA competition behind closed doors and not to play any of its remaining qualifying games at Poljud. A fine of €100,000 was also imposed. The Croatian Football Federation appealed against the decision and a hearing was scheduled for 17 September 2015. Croatia's appeal was rejected. ↑ 1.0 1.1 Serbia's abandoned home match against Albania was awarded as a 3–0 win to Albania after decision from the Court of Arbitration for Sport, and Serbia was also deducted three points because home fans invaded the pitch and attacked Albania players when a drone carried a pro-Albanian flag over the stadium. The match was originally awarded as a 3–0 win to Serbia, who also received a three point deduction, after a disciplinary decision from UEFA. The decision was appealed by both Serbia and Albania, but was upheld by UEFA. Both associations then filed further appeals to the Court of Arbitration for Sport, and on 10 July 2015 the Court of Arbitration for Sport rejected the appeal filed by the Serbian FA, and partially upheld the appeal filed by the Albanian FA, meaning the match is deemed to have been forfeited by Serbia 3–0 and they are still deducted three points. 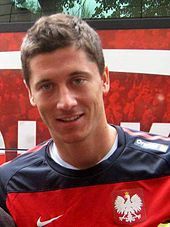 Robert Lewandowski hjá Póllandi skoraði 13 mál í UEFA Euro 2016 kvalifiseringsumfarinum, og endurtók metið hjá David Healy hjá Norðurírlandi ið varð sett í UEFA Euro 2008 kvalifiseringini við at hava skora flest mál í einari einstakari UEFA Euro kvalifikatiónskapping. ↑ "UEFA European Football Championship Final Tournament 2016: Tournament Requirements" (PDF). UEFA. June 2009. p. 6, sec. 1. http://www.uefa.com/MultimediaFiles/Download/Regulations/uefa/Others/84/03/26/840326_DOWNLOAD.pdf. Heintað 25 June 2012. ↑ "France beat Turkey and Italy to stage Euro 2016". British Broadcasting Corporation. 28 May 2010. http://news.bbc.co.uk/sport2/hi/football/europe/8711016.stm. Heintað 25 June 2012. ↑ "Pots announced for EURO qualifying draw". UEFA.com. 24 January 2014. http://www.uefa.com/uefaeuro/finals/news/newsid=2036613.html. ↑ "National Team Coefficients Overview". UEFA.com. http://www.uefa.com/MultimediaFiles/Download/competitions/General/02/04/77/16/2047716_DOWNLOAD.pdf. Heintað 29 January 2014. ↑ "Qualifying draw". UEFA.com. 23 February 2014. http://www.uefa.com/uefaeuro-finals/draws/round=2000446/index.html. ↑ "UEFA EURO 2016 qualifying draw procedure". UEFA.com. http://www.uefa.com/MultimediaFiles/Download/competitions/Draws/02/04/64/31/2046431_DOWNLOAD.pdf. ↑ "Gibraltar and Spain kept apart in Euro 2016 draw". Reuters via Yahoo Sports. 24 January 2014. http://sports.yahoo.com/news/soccer-gibraltar-spain-kept-apart-euro-2016-draw-122831948--sow.html. ↑ "Croatia deducted one European Qualifiers point". UEFA.com. 23 July 2015. http://www.uefa.com/uefaeuro/qualifiers/news/newsid=2267337.html. ↑ "Point deduction stands for Croatia". UEFA.com. 18 September 2015. http://www.uefa.com/uefaeuro/news/newsid=2284498.html. ↑ 10.0 10.1 "FOOTBALL: The CAS rejects the appeal filed by the Serbian FA, upholds in part the appeal filed by the Albanian FA: the match Serbia-Albania is deemed to have been forfeited by Serbia (0-3)". Tribunal Arbitral du Sport / Court of Arbitration for Sport. 10 July 2015. http://www.tas-cas.org/en/general-information/news-detail/article/football-the-cas-rejects-the-appeal-filed-by-the-serbian-fa-upholds-in-part-the-appeal-filed-by-the-albanian-fa-the-match-serbia-albania-is-deemed-to-have-been-forfeited-by-serbia-0-3.html. Heintað 10 July 2015. ↑ "Disciplinary decision on Serbia-Albania match". UEFA.com. 24 October 2014. http://www.uefa.com/uefaeuro/qualifiers/news/newsid=2172207.html. ↑ AFP (24 October 2014). "Albania to appeal UEFA punishment over Serbia". Business Insider. http://www.businessinsider.com/afp-albania-to-appeal-uefa-punishment-over-serbia-fracas-2014-10. Heintað 26 October 2014. ↑ "Serbia to appeal UEFA decision". Goal.com. 24 October 2014. http://www.goal.com/en/news/755/europe/2014/10/24/5448671/serbia-to-appeal-uefa-decision. ↑ "Decisions upheld for Serbia-Albania match". UEFA.com. 2 December 2014. http://www.uefa.com/uefaeuro/qualifiers/news/newsid=2190630.html. ↑ "The football associations of Albania and Serbia file appeals at the Court of Arbitration for Sport (CAS)". Court of Arbitration for Sport. http://www.tas-cas.org/fileadmin/user_upload/Media_Release_3874_3875__2_.pdf. Heintað 8 January 2015. ↑ "Lewandowski equals Healy's scoring record". UEFA.com. 11 October 2015. http://www.uefa.com/uefaeuro/qualifiers/news/newsid=2292506.html. »Undankapping til EM í fótbólti 2016« í Wikimedia Commons. Hendan síðan var seinast broytt 12:13, 4. jul 2016.